Appendix Quarter Horses are the first generation cross between a registered Thoroughbred and an American Quarter Horse. They are registered as appendix but not initially eligible for a full AQHA registration. The cross began in Texas and quickly took hold when the horse racing industry brought Thoroughbred bloodlines into the Quarter Horse Association. Initially they were met with resistance by board members, but they relented to the cross with Thoroughbreds that held Quarter Horse type characteristics. Through the years and selective breeding the resulting cross is a larger animal (15 – 17 hands), with more refined features. 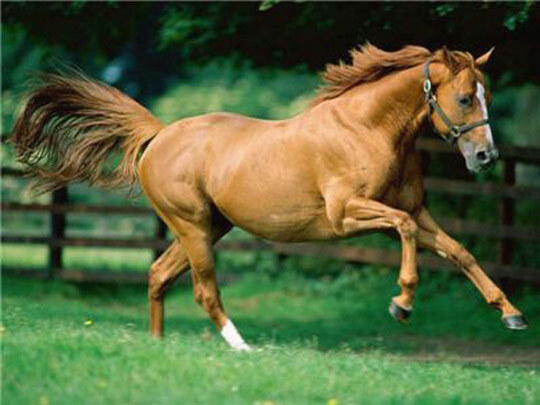 They are found in black, chestnut, grey, bay, dun, roan, palomino, and buckskin.